...and if you say otherwise I will rocket punch you! Yeah, so, ever since I saw Pacific Rim when it first came out I've been pretty much obsessed with this movie. Unfortunately it seems that there is a lot of people out there who think that Pacific Rim is merely an awesome dumb movie. Or a well done dumb movie. Or a dumb movie that knows its dumb and doesn't take itself too seriously. These people are all idiots. Because dumb movies have dumb characters and dumb plots and dumb themes. Pacific Rim has none of these. It has strong (if simple) characters, a simple plot, and the most beautiful theme I have seen in a summer block buster to date. Let's look at these in order, eh? One of the major mistakes people are making with Pacific Rim is judging characters by their dialog. This is lazy, and does a disservice to one of the most visually intelligent movies I have ever seen. 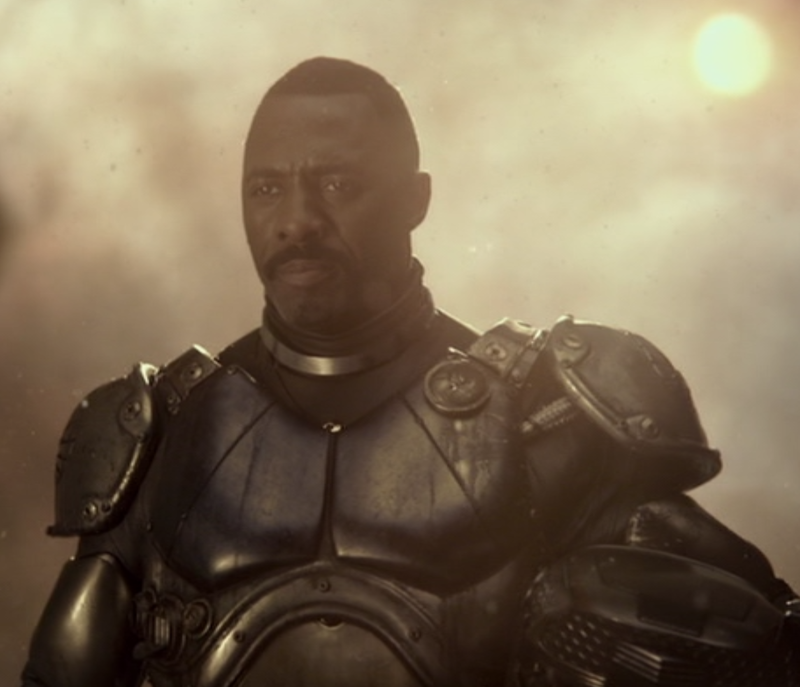 Pacific Rim establishes its characters quickly and efficiently, and it does this primarily through colors and visual themes, not through dialog. These two are badasses and they know it. These two get hardly any screen time and even less dialog, yet they are incredibly well established (and possibly my favorite) characters! They aren't established through dialog, they are established through their body language, through their attitude. Take the dinning hall scene for example. Blink and you'll miss it but its an important establishing moment for Sasha, who is clearly the dominate one. When she beckons her husband over to join her, its a sensual motion. When he sits down she puts her arm around him protectively. In a 10 second background shot we already have the dynamic of their relationship spelled out for us! "I'm doing you a favor by not starring you down until you cry in shame." There is so much more I could say about these two, but its been said in other places on the web, so let us move on to Mako, the strongest female lead I've seen this year. Mako doesn't have a lot of dialog, but she doesn't need it. We learn far more about her in this movie than we learn of Princess Leia in an entire trilogy. To understand Mako let's start with the scene where she and Raleigh drift for the first time. When Mako begins chasing the RABIT we see the traumatic attack in which she loses her parents. Notice the color of her coat. Remind you of anything? See, if you're clever, or even just observant, you realize that Mako is purposefully dying her hair the color of her coat on the day she lost her family. This tells you so much about her character without a single line of dialog ever being spoken! She's carrying that day with her, she can't stop thinking about it. She's obsessed with it and it shows! Throughout the film she is begging and pleading with Stacker Pentecost to give her a chance to avenge her family. Anyone hungry for some crab? The lighting is over the top. He's bathed in this golden, almost angelic, light. But remember, this isn't cinematographic eye-candy, this is Mako's memory! This is how she remembers Stacker Pentecost, as the knight in shining armor who saved her from the dragon, literally! From this single scene, also lacking in dialog, we can infer the complex dynamics of these two characters relationships. Mako loves and respects Stacker, and Stacker wants to protect his adopted daughter. This makes Mako a rare thing in the movies, she's a woman who knows what she wants and knows how to get it and isn't afraid to challenge the one person she cares about more than anyone to get it! Wow. I could talk about Raleigh or the Australians, but I've basically written a full length post here and I have several more things I want to discuss. I watched the director's commentary and one of the things that Guillermo del Toro says is that Pacific Rim is better understood as a sports movie. Its plot is structured very much like a sports movie, and this makes a lot of sense considering its theme (which I will get to later). In a lot of ways Raleigh Becket's story is that of the forty year old rookie. He's much younger than that of course but the parallel remains. Look at the sequence of events: He's a rock star until Alaska where he suffers a major defeat and quits. He's then recruited by the coach for a new team. He screws up royally in practice and gets benched. The team suffers a terrible defeat and he has to take the court. He wins. He leads the team in one last desperate game and wins by the skin of his teeth. This is not merely a movie about giant robots punching giant monsters. Don't get me wrong, Pacific Rim is most definitely Del Toro's finely crafted love poem to both the Mecha and Kaiju genres, but its theme is entirely unconcerned about the titans that punch out the plot of this film. Look at who the winners and losers are in this film. Look at how they win and how they loose. The Kaiju are not defeated by superior fire power, they are not defeated by grim sacrifices and questionable ethics. They are defeated by good old fashioned team work and determination! Everything about this movie screams "Work together! We can do it together!" From piloting the Jeagers, to the multinational composition of the Pan Pacific Defense Corp, to the diversity of the bloody scientists, the heroes in Pacific Rim win because they over come their differences and work together to defeat their foe. Pacific Rim's theme is upbeat. Its a very humanistic and optimistic theme. I suspect Gene Roddenberry would have loved this film. Pacific Rim looks at the darkness of other summer blockbusters such as The Dark Knight Rises, Man of Steel, and Iron Man 3 and says "To hell with this I'm gonna live!" 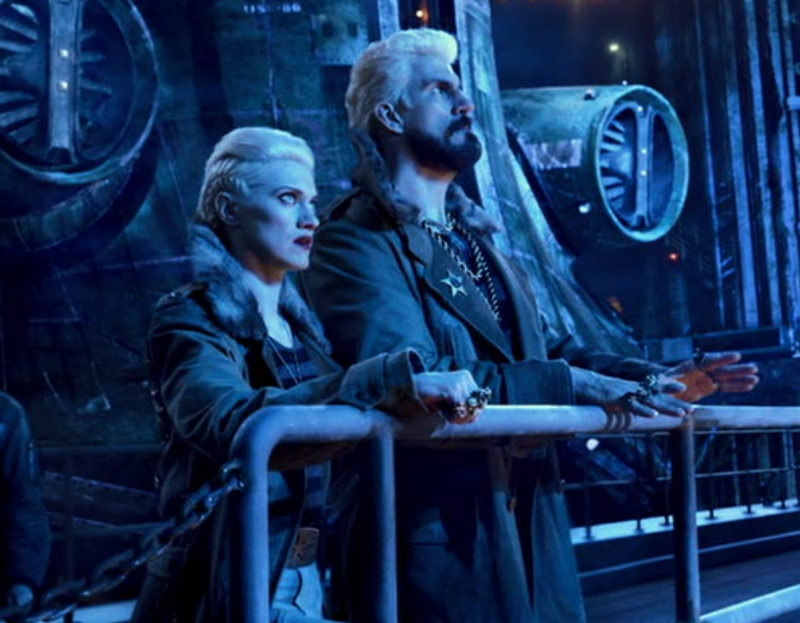 And this is one of my favorite things about Pacific Rim. Though I am by no means a humanist, I much prefer the optimism and desire for unity that pervades humanism to the despair and decay that is nihilism. Nihilism seems to have cornered the market on summer block busters. Giving us tons of movies loaded with antiheroes and darkness. But you have to love Pacific Rim on its own terms. You have to check your attitude at the door. 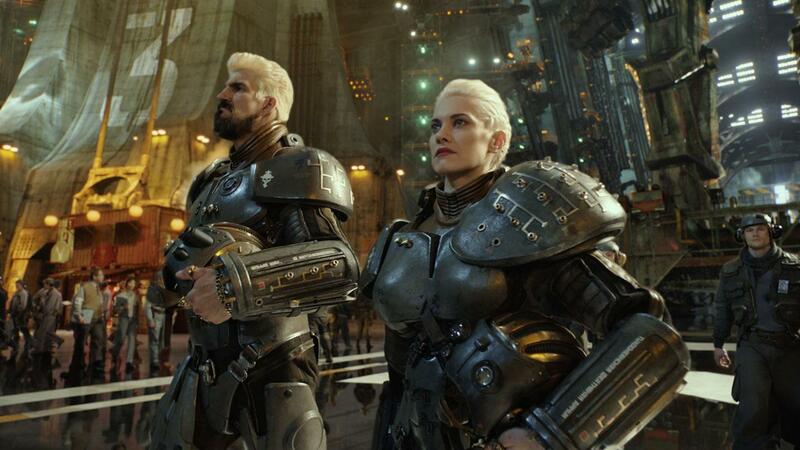 You have to be willing to listen and understand Pacific Rim in its own language. The language of color, and gesture and bombast. I'm not saying that Pacific Rim is an intellectual giant of a film, its not. Its a simple movie. But I am saying that simple does not equal dumb. Those of you saying otherwise can get eaten by a Kaiju. Films do not have to be sophisticated or dark to be good. Look at the original Star Wars movie. The plot is a straight line, the characters are all archetypes, and the dialog is contrived. Yet it is a great movie! There is a lot I've left unsaid here, perhaps I will visit the subject again. I'd love to discuss things like drifting, how Mako would have been fine if Raleigh hadn't lost control first, the importance of the red shoe, and the importance of red in general. There is a lot more going on in Pacific Rim than people are giving it credit for.